Lake Tanganyika is not the most species-rich of the Great East African Lakes, but comprises the greatest diversity of cichlid fishes in terms of morphology, ecology, and breeding styles. The lake contains a polyphyletic assemblage of cichlid lineages, which evolved from several ancient species that colonized the emerging lake some 9–12 million years ago. Based on morphological characteristics, the Tanganyikan cichlids have been classified into 12, or, more recently, 16 tribes, which are largely supported by molecular data. The radiations of East African cichlids are believed to be driven by complex interactions between extrinsic factors, such as climatic changes and geological processes, and intrinsic biological characteristics of the involved organisms. 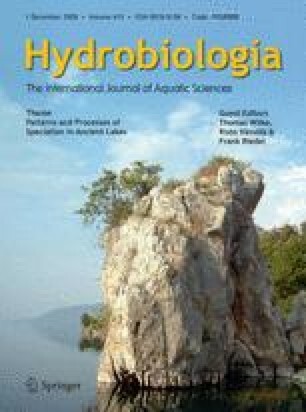 Diversification within different lineages occurred simultaneously in response to drastic habitat changes such as the establishment of lacustrine deep-water conditions 5–6 MYA and subsequent major lake-level fluctuations. This seems particularly true for the mouthbrooding lineages whereas the substrate breeders underwent a more gradual process of diversification. This review presents an account of the taxonomy and phylogeny of the Lake Tanganyika cichlid species assemblage, its relationship to the African cichlid fauna, key factors leading to the astonishing diversity and discusses recently proposed alternative age estimates for the Lake Tanganyika cichlid species assemblage. We thank P. Ngalande, H. Phiri, and the team at the Mpulungu station of the Ministry of Agriculture and Cooperatives, Republic of Zambia, for their longstanding cooperation during fieldwork. We are further grateful to B. Egger and two anonymous reviewers for valuable comments on earlier versions of the manuscript. Financial support was provided by the provincial government of Styria to KMS and the Austrian Science Foundation (grants P17380 to KMS and P17680 to CS).